Do you confuse about your Facebook timeline with lot of posts and missing your favorite posts? 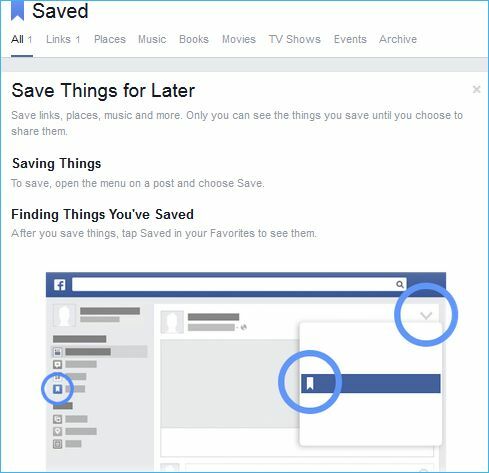 Facebook has introduced a new feature called “Save” option that enables you to save links or bookmark your favorite posts for read it later. When you browsing the Facebook page you might find some useful posts or interesting links and you don’t have time to read it that time. So you can use Save that links and bookmark the posts on Facebook and read it later when you are free. This Facebook Save feature allows you to save any kind of links, places, events, music and images from your news feed and you can read later on your mobile too. This feature is not only for desktop users and it is also supported in Android and IOS mobile apps. How to Save Facebook Links for Read Later? Browse through your Newsfeed and click the arrow mark on the top right side of your favorite post which you want to read it later. You can see the option “Save” with the name of the link. Click save option and the link will be saved on your newsfeed. 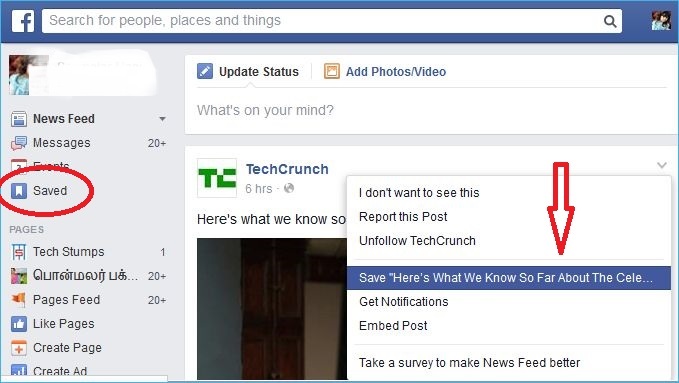 How to Access Saved Content on Facebook. You can see the new option “Saved” on your favorites menu below your Facebook profile name. All of your saved content is placed there and you can access them easily. The saved content is divided into few categories including links, places, movies, TV shows, books etc. You can access specific type of posts easily and you can delete the posts by click on “X” button instantly. So this is useful tool to save your favorite and important links and posts from your friends.